SATELLITE FLYBYS APP: Turn your iPhone or iPod into a field-tested satellite tracker! Spaceweather.com presents the Satellite Flybys app. "I happened to take a stroll outside last night," says photographer David Harvey of Tucson, Arizona. "The Moon was nearly overhead and surrounded by this eye-catching 22o halo." Such haloes are formed when moonlight passes through pencil-shaped ice crystals floating in high freezing clouds. 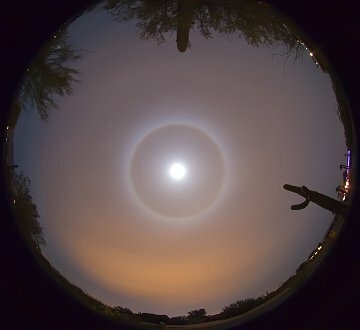 When you see a 22o moon halo, be alert for moondogs and moon pillars, too. They are formed by plate-shaped ice crystals that often accompany their pencil-shaped cousins. The Moon is full on Dec. 31st. Mark your calendar for haloes. On December 29, 2009 there were 1091 potentially hazardous asteroids.